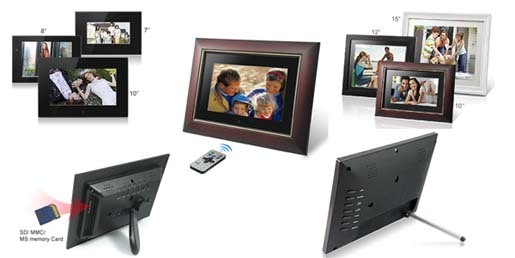 New Model Digital Photo Frame Comes From Earth Trek! Earth Trek is becoming one of the most popular manufacturers of Computer Peripherals. The company releases a new model digital photo frame as the follower to the Wireless Presenter Mouse 2-in-1 device. The device is available in the sizes of 7”/8”/10”/12”/15” along with HD LCD Display at the resolution of 1024 x 768. The aspect ratio of the device is 4:3 to 16:9. Moreover, the photo frames supports format Picture & Movie Playback and MP3 format Music Playback. At the same time, it also supports USB and SD/MMC/MS memory card. Other major features are A/V output jack, IR Remote controller, Alarm and Calendar.